FINAL SALE. This dress manages to be fun yet professional at the same time. The Walking Contradiction Black and Ivory Pattern Dress is made of a textured fabric with a bit of stretch to it. It is fully lined, except at the sleeves. 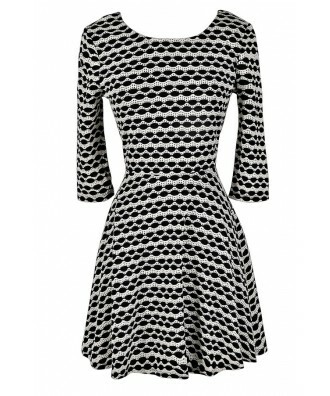 We love the wavy black and ivory pattern throughout this dress that gives it a fun and whimsical vibe. We also love the flattering cut with the rounded neckline, three quarter sleeves, and A-line skirt. A fabric gathered bow in the back completes this look. The Walking Contradiction Black and Ivory Pattern Dress is a flattering look that works year-round. It looks nice paired with black or ivory pumps, wedges, or strappy heels. Pair it with black tights and a jacket on cold winter nights. Another option is to wear a black or ivory fabric sash or belt around the waist for contrast. We love this adorable dress! Details: Lined. 65% polyester, 35% cotton. Lining: 100% polyester. Hand wash cold gently. Use non-chlorine bleach if needed. Line dry. Cool iron if needed. Small measurements: Length from top of shoulder to hemline: 33". Bust: 32". 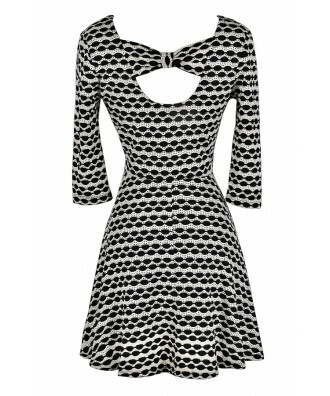 You have added Walking Contradiction Black and Ivory Pattern Dress into Wishlist. You have added Walking Contradiction Black and Ivory Pattern Dress for Stock Notification. You have set Walking Contradiction Black and Ivory Pattern Dress as a loved product. You have removed Walking Contradiction Black and Ivory Pattern Dress as a loved product.